The sporty midsize SUV in the German automaker’s portfolio BMW X3 has continued to impress many over the recent years. At the 2019 Geneva Auto Show, a new plug-in hybrid variant of this popular SUV was unveiled and it was also promised that a fully electric X3 will be wrapped off in 2020. The latter fact was also confirmed when a variant called iX3 was spied during winter testing in Arjeplog, Sweden. 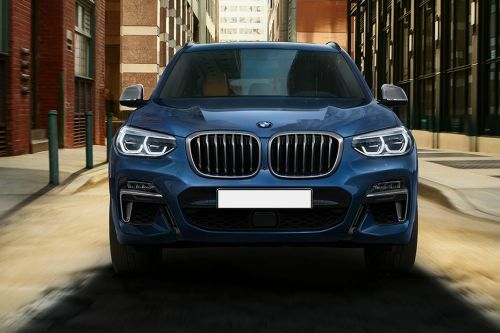 BMW has also added the new 2020 X3 M along with the X4 M in its line up and their production will start in April 2020. BMW X3 is available in two different variants - XDrive 30i and m40i xDrive. The former carries a price tag of AED 295,000, while the latter is priced at AED 340,000. The top-spec m40i xDrive features a 3-litre six-cylinder DOHC engine, which is capable of returning a maximum power of 360 hp along with a peak torque of 500 Nm. It can speed up from 0 to 100 kmph in just 4.8 seconds and can hit a top speed of 250 kmph. The car has AWD system and comes with a 7-speed automatic transmission. X3 is available in 3 different colors - Alpine Whte, Glacier Silver and Phytonic Blue. The X3 serves its purpose as the only midsize SUV from BMW’s portfolio. With its sporty design elements blended with the bulkiness and stance of a traditional SUV, the BMW X3 has impressed many in recent years. The BMW X3 has received some very comprehensive changes not a long time ago, which have brought in a number of features and technologies on board. The lack of visual drama on the outside of the BMW X3 seems balanced as soon as you step inside of the SUV. The interior cabin is a huge departure from what it used to be before, with many new design elements making their debut in the X3. The three-spoke steering wheel with aluminium inserts on the spokes and differently styled buttons and center boss, along with the fully digital but simply styled instrument console, make the driver’s cockpit elegant and sporty at the same time. The hexagonal shaped center console, with the upper half housing the AC vents and lower half housing the controls for infotainment system and climate control, looks unique as well. The right amount of aluminium around the center console and transmission tunnel, along with the various leather upholstery options to choose from, lift up the overall ambiance very nicely. The BMW X3 packs in some really nice features which are in league with the competition, with sport seats and cargo and comfort function for the rear seat passengers enhancing the comfort on the inside. The overall size and dimensions of the BMW X3 make it a perfectly sized vehicle for the midsize SUV segment. However, the overall styling is quite staid by the current norms and trends, and while the sporty design elements at places do manage to lift the appeal, the styling in total is less flashy as compared to the rivals. At the front, the trademark kidney grille gets small headlamps on either sides with rounded edges, which unlike the current BMW offerings, do not blend with the front grille. The front bumper gets aggressively styled cuts and creases around fog lamps and center portion, which adds some substance to the front stance of the X3. The side profile looks like a smaller version of the X5, with the exact cuts and creases on the side doors and fenders, with perfectly sized wheel arches adding to the muscular appeal of the SUV. At the rear, the overall stance looks somewhat sleeker than the previous generation X3, thanks to the thinner than before three-dimensional L-shaped full LED tail lamps. The BMW X3 packs in BMW’s XDrive all-wheel-drive technology, which enables the slightly stiffly sprung suspension of the X3 in tackling all kinds of bad roads with ease. The other common technologies of BMW, such as drive modes as well as variable suspension settings make sure that one can change the driving preference of his depending upon the terrain he is going to drive on. The BMW X3 comes with three engine options under the hood - one petrol and two diesel powertrains. Talking about the petrol engine first, the twin turbo 3.0-litre V6 petrol engine shared with the 5 Series generates 360 PS of power and 500 Nm of torque. Coming to the diesel engines then, the smaller 2.0-litre four-cylinder diesel mill pumps out 190PS of power and 400Nm of torque. On the other hand, the bigger 3.0-litre V6 diesel 265PS of power and a massive 620Nm of torque. All the engines get a common 8-speed automatic gearbox mated to them. Just like all its other siblings, the BMW X3 too is well equipped in terms of safety features and electronic driving aids. The midsize SUV comes equipped with six airbags, ABS with EBD and Brake Assist, Lane Departure Warning, Forward Collision Warning, cornering brake control, dynamic traction control and hill start assist. The BMW X3 is one perfect SUV to upgrade to if you are driving an entry-level compact SUV, but don’t want a very big SUV which is intimidating both in terms of driving appeal and size. With perfectly sized dimensions and sporty styling, the BMW X3 is very drive-able in urban as well as off-road terrains, A major credits for its all-rounder appeal go to the powerful engine options as well as well-tuned suspension and steering setups. What is the price of BMW X3? On road prices of BMW X3 in starts from AED295,000 for base variant xDrive 30i, while the top spec variant m40i xDrive costs at AED340,000 .